Only Sabre Travel Network® offers endless ways to configure an agency's workspace. And their needs can be tailored specifically with Sabre® Red™ Apps available through the Sabre® Red™ App Centre. The Red App Centre brings travel buyers and developers together to create the premier b2b travel app marketplace. Agencies access the Red App Centre to search for a wide range of applications. Here they can find and purchase a Red App that best meets their needs. The Red App can then be quickly deployed down to individual users. The result? A truly flexible agency ready to serve its customers' needs. Both third-party developers and an agency with its own development group can build Red Apps. Create an app that interacts with both our classic and graphical views of the Red Workspace. Access data from Sabre® or other relevant external sources. And your app can even communicate with other apps in the Red Workspace. The possibilities are endless. The Red Workspace is available at no addition cost to Sabre Connectedsm agents. Added features may require additional fees or subscriptions; however, many are available at no cost. The Sabre Red App Centre will open up a whole new world of possibilities for your business. Check out sabreredappcentre.com today and let your imagination run wild! Download the Sabre Red App Centre (for Agencies, Corporations and TMCs) brochure. 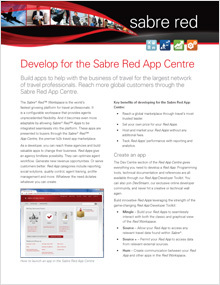 Download the Sabre Red App Centre (for Developers) brochure.